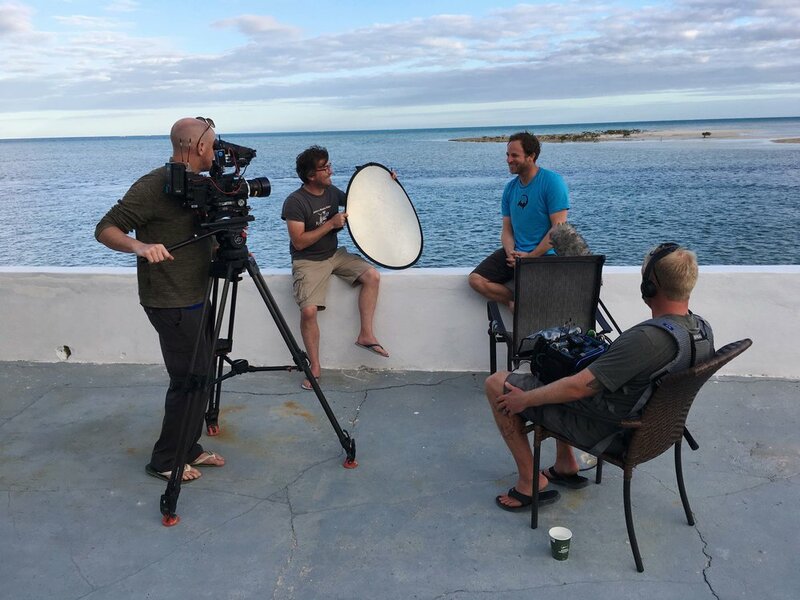 Our objective: For this shoot, our team had two days to film a free-dive and satellite tagging sequence with the pelagic and highly mobile Silky sharks (Carcharhinus falciformis), in the Tongue of the Ocean (TOTO), Andros, The Bahamas. Little is known about the migratory pathways of Silky sharks within this region of the world, and this tracking device will contribute important data, which will ultimately help improve their management and conservation. Early morning brought ominous high winds and bumpy seas, but we were excited and positive about the day’s endeavor. As most fishers will tell you, a squall the night before is usually a good sign, churning up the waters bringing in renewed productivity. The long, rough, wet journey out to our shooting location was a great wake-up, and to everyone’s delight, we were greeted by a school of young silky sharks at the surface. The sharks were full of energy, darting towards the boat as we prepared to get in the water, and yes, there were shrieks of joy (and relief) as the sharks introduced themselves in the best way possible. It’s always a little nerve-wracking when you only have two days to film a sequence, so sharks being on site immediately was a dream start. Within a few minutes Tristan, Annie, and Duncan were geared up and ready to enter the water. The conditions were not unlike a washing machine, with four to six foot seas and murky water, but there were about a dozen sharks at the surface, all full of life, so it was an easy decision to jump in. With winds gusting to 25 knots, six foot waves and lofty swells, day one was exciting, yet challenging for the entire team. 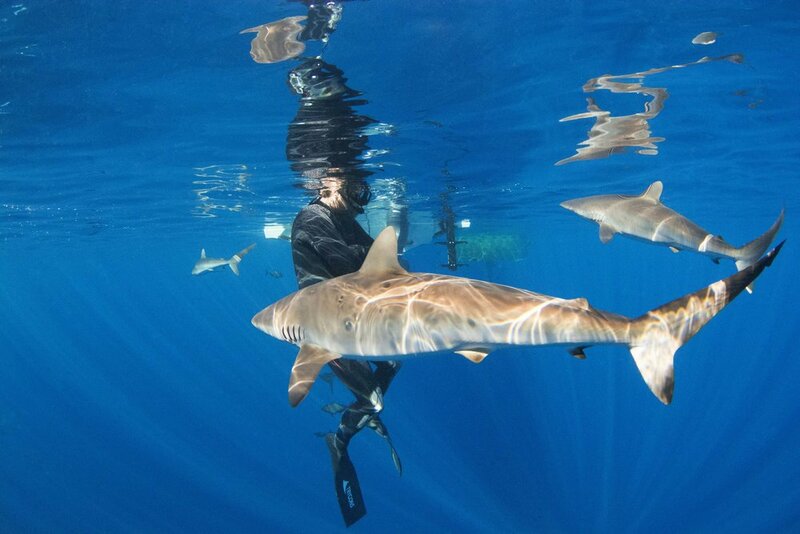 An hour flew by in a heart-beat as we enjoyed close, head-spinning encounters, whilst we filmed the sharks. 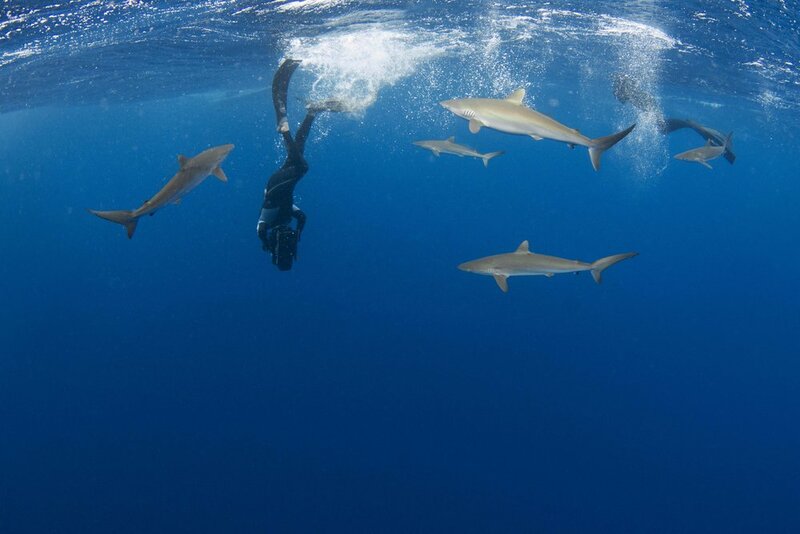 There is something special about swimming with silky sharks, they are wonderfully inquisitive, and unlike other sharks, will actually come close to you, curious about who and what you are. 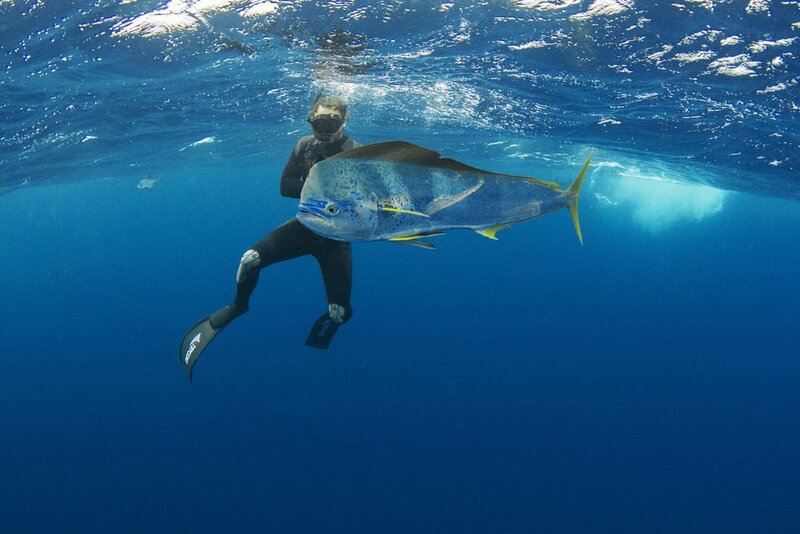 It was incredible to see two large, dazzling mahi-mahi making powerful passes with their exquisite green and blue colors lighting up the overcast conditions. At one point we counted twenty-five silky sharks in attendance, from around 80cm (2ft) to approximately 2.4m (7ft), all highly motivated, moving between the buoy and our boat. However with the turbulent seas, it soon became apparent that we were not going to be able to deploy a satellite tag, which was our main objective. Thus with the winds still gusting to 25 knots and lofty swells, we made the difficult decision to head home. 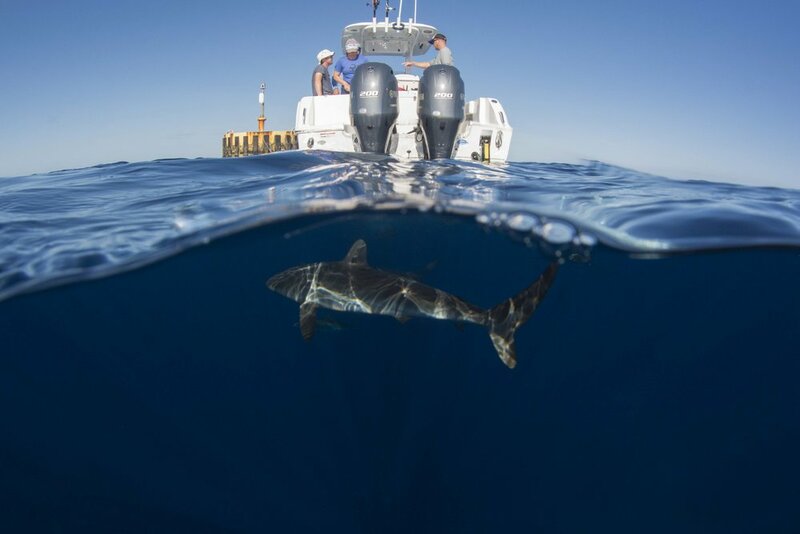 It’s not easy to leave lots of sharks and action, but we all knew it would be near impossible to safely work a shark alongside the boat and place a tag in these challenging conditions, so we headed in for the day. On arrival back at the Andros Island Bone Fish Club, we enjoyed a well earnt cup of hot tea, and proceeded to eagerly discuss the bustling shark action we had just witnessed. After a few hours of recuperation, we set about planning the next day, which was predicted to give us flat seas and 0-5 knot winds, a huge swing in the direction of calm. Weather is always unpredictable. All we needed now was for the sharks to stay, and the conditions to be as predicted. Landlocked for the afternoon, Tristan’s interview was next on the agenda. There’s nothing our team enjoys more than talking about sharks after having just spent time in the water with them, as it always brings out the most candid, honest, and freshest thoughts. Tristan talked about the behavioral characteristics of the species and the paucity of information known about their movement ecology in the northwest Atlantic. He said, “It’s terrifying to think about the numbers of these sharks that are caught globally (hundreds of thousands annually). They are the second highest shark species caught as bycatch globally, with many being juveniles never given the opportunity to reach maturity. Its crucial we learn more about the biology of this charismatic open-ocean predator, particularly as their tendency to aggregate and socialize puts them at a greater risk from exploitation”. 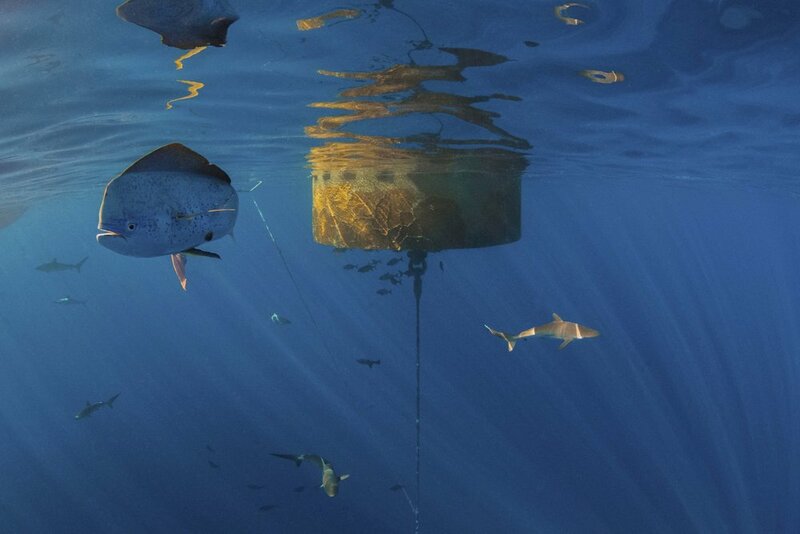 The ocean buoy where we work, acts like a magnet in the vast expanse of the open-ocean, creating a refuge for small organisms that attract bigger ones, eventually enticing in schools of pelagic fishes, such as tuna which are regularly followed by sharks, like the silkies. 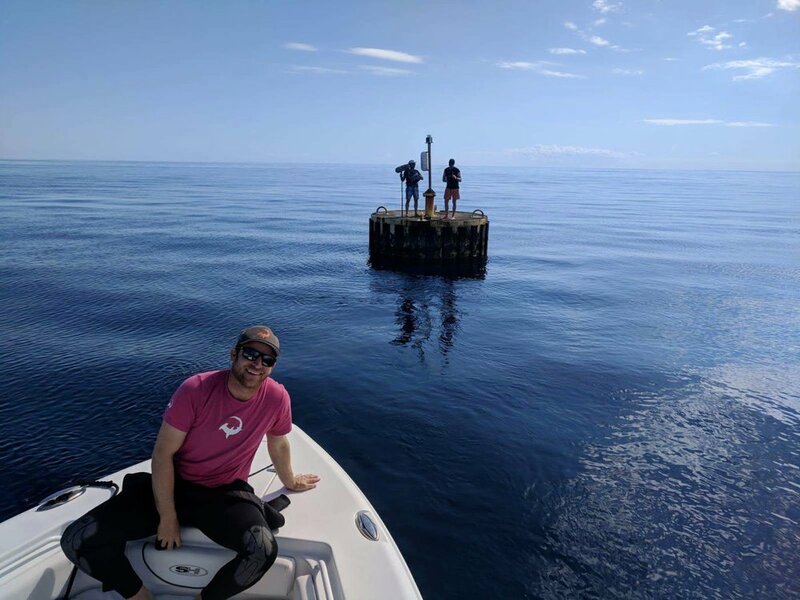 For us, this ocean buoy provides a unique location to study a typically highly mobile predator that is relatively understudied in this region of the world. A silky shark and abundance of fish swim under the buoy, our filming location. 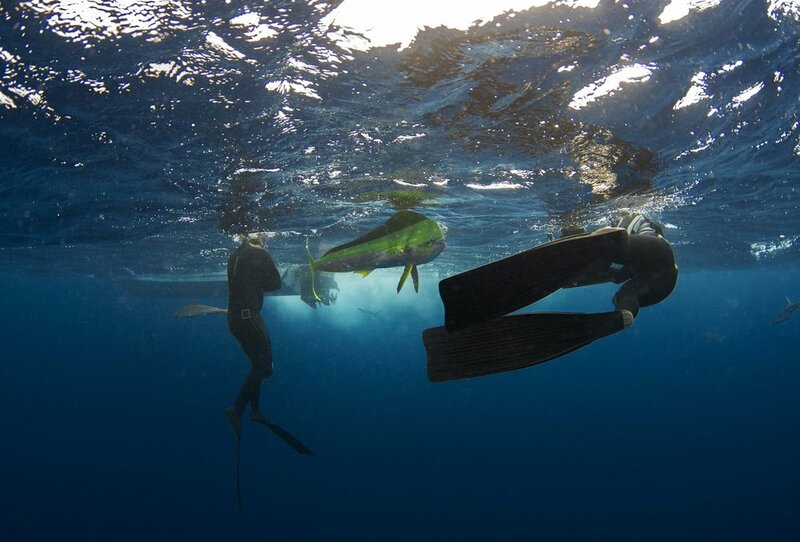 A large Mahi Mahi confidently mixes with over 25 silky sharks. And so, after an exciting and successful day we wrapped the evening up with a mini beach clean, whilst taking photos of the local lemon sharks that regularly pass by the lodge dock in the hopes of some fishermen scraps! Then, after a nice filling meal, followed by lots and lots of shark chat, it was off to bed for an early start the following day. An early rise and shine for the team with a 06:00am breakfast. We’ve all heard the expression “flat as a pancake”, but the sea’s surface that morning was, by our standards, even flatter than the proverbial pancake. The ways in which conditions flip-flop like this in a matter of hours is extraordinary, but they did. What a perfect start to the day. The boat ride out was incredibly smooth, and just like the previous day’s arrival, we were greeted by a number juvenile silky sharks, clearly interested in the latest visitors to their mid-ocean refuge. Day two saw dead flat, calm seas, over 25 sharks, mahi mahi, and an incredible amount of other life. We could hardly believe our luck! Flat, calm conditions and lots of energetic sharks, with no other boat in sight! Just as Duncan was about to enter the water, a huge, majestic female silky appeared at the surface. She was much bigger than any we had previously seen, probably just over three meters (10ft) in length, with characteristic airplane-like pectoral fins and silky smooth skin. We weren’t entirely sure it was a silky shark at first, given her size, but with her dominant, nonchalant behavior and frequent passes to inspect Duncan, we cleared up what species she was rather quickly! 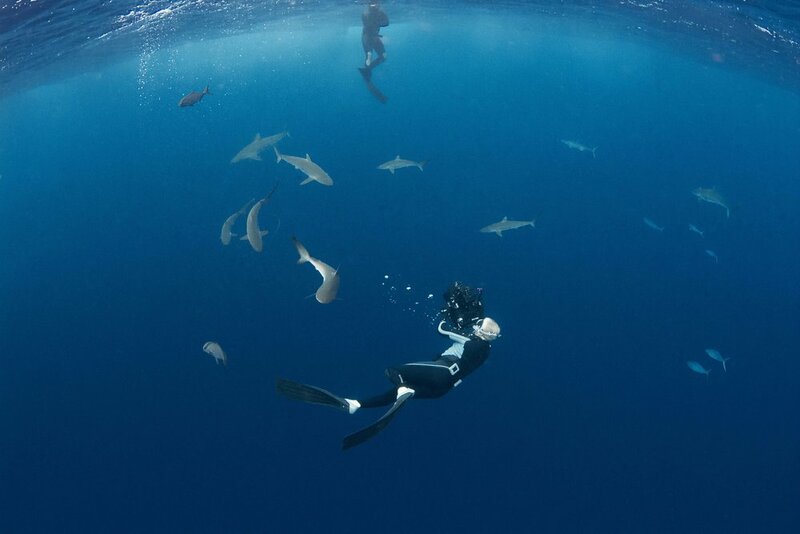 Annie and Tristan joined Duncan in the water, and we all enjoyed a spectacular dive with twenty-five silky sharks, ranging in size from 80cm to 3m, with males and females present in this mixed school. The large female silky made some close passes to satisfy her curiosity, but soon decided to observe the action from afar. It was finally time to catch and tag a silky shark. Using a novel hand capture method, where the upper lobe of the tail is bent backwards, we were able to subdue a free-swimming 1.7 meter shark. The tail bend, along with turning the shark upside-down, seems to place them in a catatonic state, in which they relax into position and don’t move. During this brief calm window, Annie tied a rope around the tail underwater. The shark woke, and we quickly finished securing her to the side of the boat for the work-up to be completed. With the help of Cole and volunteer Jenna, we took a genetic sample, length measurements (she was 1.64 meters), placed a PIT tag (electronic microchip), and attached a pop-off archival satellite tag- This device collects depth and temperature data every five minutes for thirty days, after which it releases, surfaces and begins to send information to Argos Satellites, ready to be decoded and sent to Tristan’s computer for interpretation. 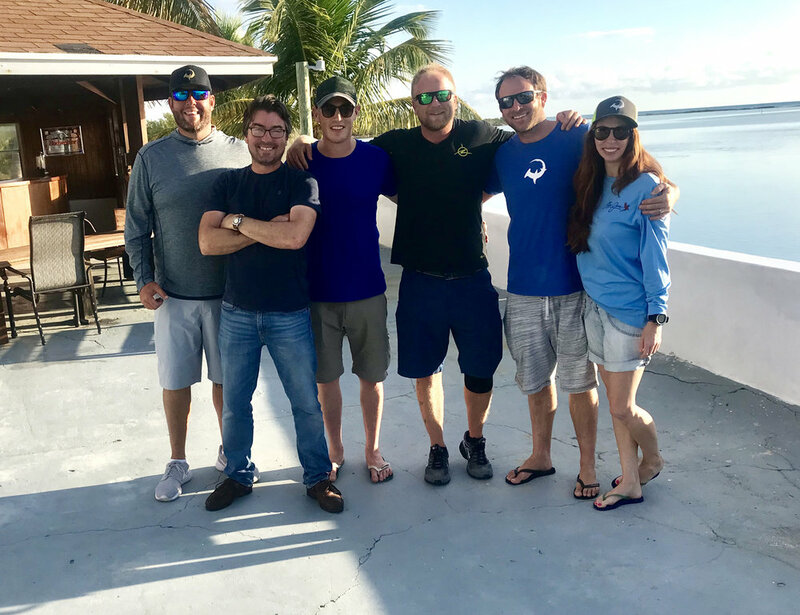 There was a focused silence whilst the tag was positioned, but after she swam off strong, diving to the depths, we were ecstatic to know that we had deployed our first satellite tag in the Tongue of the Ocean, officially and formally kicking off our Silky shark research project in Andros Island, Bahamas! With our satellite tag deployed we moved on to filming the b-roll; interviews, drone imagery and boat drive-by/in action shots were captured and we drew a line under the days incredibly successful filming. 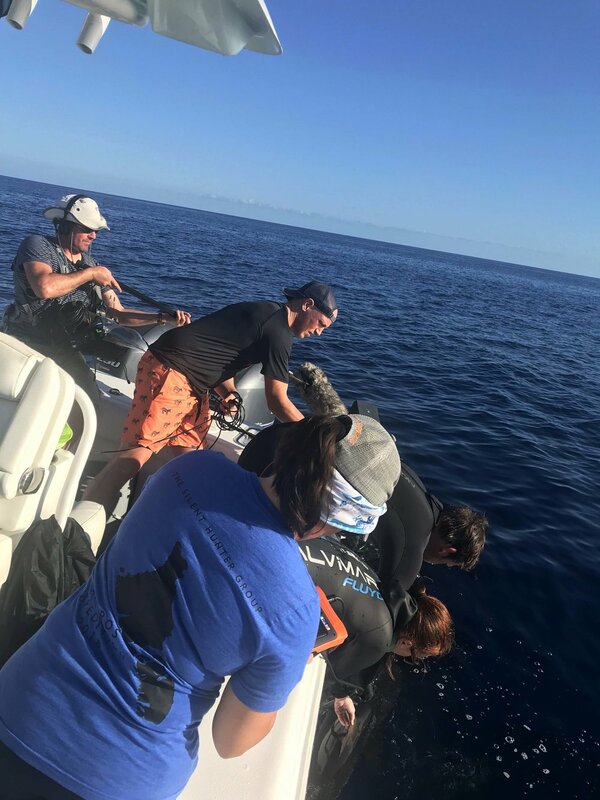 The water conditions were glorious, and after the fast-paced tagging session, all the team, including the BBC crew, enjoyed some time swimming amongst the sharks. It’s a strange feeling being out in the middle of the ocean with 1000 meters below you, and sharks swirling around you. After a few minutes, though, it becomes a mesmerizing experience, one that you never want to end. But all good things come to an end, and we headed back to the lodge for the final time. On arrival we cleaned up, had dinner, and enjoyed the sun setting whilst viewing the local lemon sharks once again. Another great evening finished off a spectacular day! You can watch the final show via the BBC iPlayer website HERE, or watch a shortened version of our segment on the BBC’s Facebook page, found HERE. 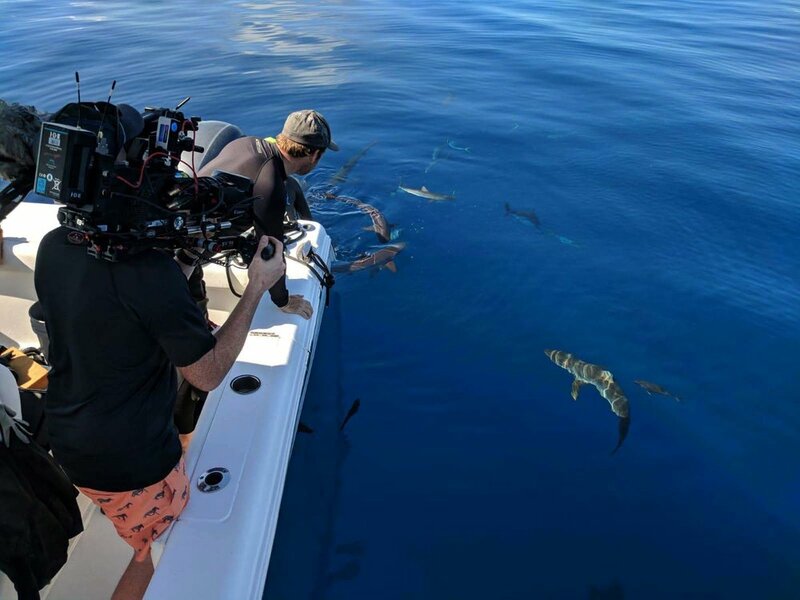 We hope this short sequence for the BBC Blue Planet Live Special will provide a glimpse into the life of the charismatic silky shark, inspire people to care about our oceans, and go down as the successful launch of our long term Andros research project. We would like to take this opportunity to thank the BBC for allowing us this incredible opportunity; to place the Andros silky sharks in the spotlight, and for supporting our research efforts. Gratitude must also go to Annie Guttridge, Duncan Brake, James Coleman Mcvay, Jenna McKenzie and of course the BBC for their generosity in allowing us to use their images in this blog. Our team are delighted to report that, exactly as expected, the satellite tag started to send its data thirty days after deployment. We are extremely excited for the next deployments this April. You can see the dives our first satellite-tagged female silky shark made, as well as regular periods within 50 meters of the surface, and a few interspersed 400 meter deep drops to the mesopelagic layer -- possibly for navigation -- to temperatures of 18C. Whether this species stays in the Tongue of the Ocean throughout the year is unknown. Perhaps they display some level of residency, or possibly travel into the Northeast Providence Channel, or farther still into the high seas. Whatever they do, our work will reveal more over the coming few months. First results are in, our silky likes to dive!